Cathedral beat Upland to win the Air Assault at Bonita on Saturday evening. Reports from people at the final game are that it ended with both teams getting into a fight and was called early with Cathedral ahead. No local teams made the semifinals. A scary moment happened when Diamond Ranch defensive back Alec Flanagan suffered a head injury and was taken to a local hospital. Word from D-Ranch head coach Eric Martinez on Saturday night was that Flanagan had a concussion and was going to be released from the hospital. Next up: SGV Shootout at Arroyo on July 8 July 1. The edict from CIF was clear on Thursday when the Southern Section office announced the football playoff division groupings for the upcoming season. Have success and you’re moving on up. The only question is how much. The Southern Section had until early August to make public the new playoff groupings, but like last year, they are out early. And now all local teams know exactly where they stand and what the competition will be should they make the postseason this November. Last year was the first season played under the current format of grouping football playoff divisions based on competitive equity rather than by league, as had been done for decades. Every year the divisions will change with teams moving up or down based on the previous two season’s worth of data. Arroyo, which was the only area team to win a CIF championship, was a glaring example of the new system at work. The Knights won Division 12 and on Thursday found out they are being bumped up a notch to Division 11. Well, in Arroyo’s case, a division championship meant going up one division. In Charter Oak’s case, making the semifinals in Division 4 was enough to help get the Chargers moved up to Division 3. La Mirada, which reached the Division 3 championship game is now in Division 2. For some teams, there was no movement at all. Bishop Amat remained in Division 1 despite being ousted in the first round last season. The Lancers probably still carry a lot of weight because the 2015 team reached the semifinals and that season is still considered in the data. La Habra shocked a lot of people by winning two games in the Division 2 playoffs last season and the Highlanders almost got bumped up to Division 1 because of it. Instead, La Habra was the last team after the cutoff between Division 1 and 2 and will remain in the same place at least for this season. Los Altos made the Division 6 championship game last year and will be boosted to Division 5. And South El Monte, which made the semifinals in Division 13 is now in Division 12. The largest division is the lowest, Division 13. There are 81 teams in that division while the top two divisions each have 18. Outside of the area, there were several moves worth noting. Calabasas, which has been transfer central in the past couple years and has had big success, flew up three divisions (the biggest jump of any program) to from Division 5 to Division 2. Both Upland and Tesoro were dropped from Division 1 to Division 2. They were replaced by Murrieta Valley and San Clemente. June isn’t the optimal month for a major coaching change. But that’s exactly what took place earlier this week with the La Canada High School football program. Ryan Zerbel resigned announced his resignation after two seasons to take a middle school physical education teacher job at Sandburg Middle School in Glendora. Zerbel was almost immediately replaced by Jason Sarceda, who spent the past three seasons as defensive coordinator. “Timing could have been better, I guess, but when this takes place, you have to get it,” Sarceda said. “You have to make it happen. I’m not going to let these boys down, so I took this opportunity and I’m excited. Zerbel was 9-10 in his two seasons, but people are still thinking about what might have been last season if La Canada had gotten standout running back Drake Beasley eligible following his transfer from Loyola in the offseason. Instead, CIF declared the transfer was in breach of the prior contact rule and Beasley never played a down for the Spartans. Before being head coach at La Canada, Zerbel spent three seasons as head coach at Workman. Zerbel said he did not foresee this move coming but couldn’t pass up the new opportunity. “This job just came open and it’s four miles from my house,” Zerbel said. “It’s just one of those thing, it’s better for my family in the long run. It’s bittersweet, though, because I think we’ve done a lot of good things at La Canada the last couple years. Sarceda’s first big challenge will improving the program’s overall numbers in terms of roster size. Last year’s team graduated over 20 seniors and participation has been a bit of an issue during offseason workouts. La Canada is thriving in other boys sports. The Spartans won Rio Hondo League championships in both basketball and baseball this past school year. Let’s play connect the dots with the La Mirada High School football program. In December, wildly successful head coach and the face of Matadores football for the past 25 years Mike Moschetti resigns following a CIF championship game loss to Edison … in March the school names Moschetti assistant Joaquin Aguilar as its new head coach … in spring, it’s learned that following next school year La Mirada will be playing in a four-team league starting with the 2018-19 school year … just last week, Moschetti, in a somewhat unprecedented move, takes to social media to announce he has been moved from the high school to a grade school to continue teaching physical education. What’s followed since Moschetti’s announcement has been a social media firestorm that’s featured recently graduated players and parents lighting up the school’s administration with either short blasts or incoherent and long-winded cries of displeasure. Moschetti has always been able to strum the psyche of his hometown like a banjo. So, the rip-roaring response from his online contingent is no surprise. But conversely, Moschetti has put in far more to La Mirada football than he could ever hope to get out. With the start of the season less than 100 days away, La Mirada football looks to be in serious peril. There are no on-campus varsity football coaches. Although he had technically resigned his football post, Moschetti was still playing a big role behind the scenes, meeting with college recruiters and such. But he’s now preparing to teach 2nd Graders the fundamentals of the I-formation to whatever degree that they’ll understand it. 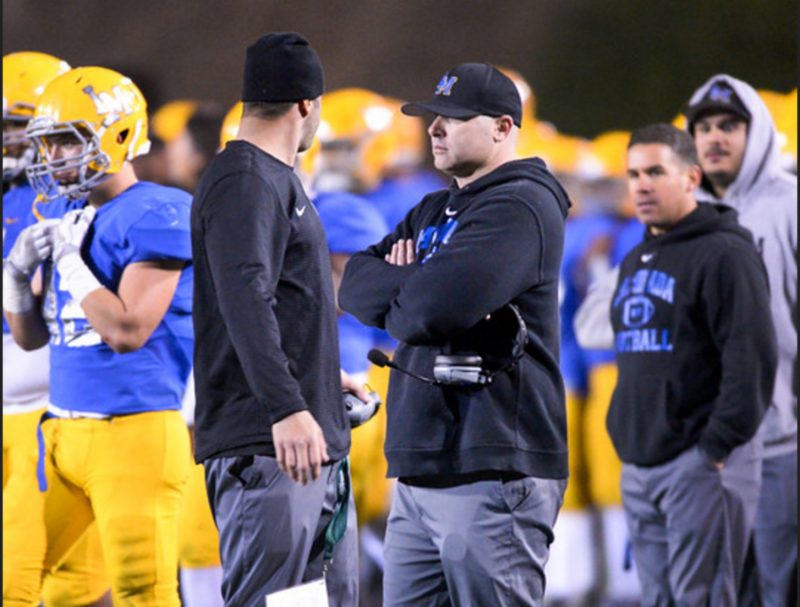 The usual bevy of transfer excitement that was key in lifting La Mirada’s program from powerful neighborhood team to among SoCal’s elite has been awfully quiet of late. To wit, La Mirada has not landed one impact transfer this offseason. At least not yet. And what are the odds it happens now? Keep in mind that this is a program that, according to casual estimates, has had around 50 transfers in the past four seasons. Also keep in mind that CIF is about to reward La Mirada for all of its recent success by likely sending the Mats to Division 2. Of course, that only matters if you make the playoffs. Indeed, the post-Moschetti era is off to a horrible start. Aguilar and his coaching staff now have to pick up the pieces. They’re good enough to do so but sans the type of transfer talent that made the program go the past few years, and given all the ongoing distractions, La Mirada looks like it’s headed to a gun fight with a butter knife against yet another ridiculously tough nonleague schedule that includes Mater Dei, Orange Lutheran and Upland. For those sitting back taking joy in La Mirada’s demise-in-progress, just know that this could happen to you. It’s a great reminder that all top public school football programs (and some privates) are merely a house of cards. It’s also a reminder that when you live by the transfer, success is an escalator up and an elevator down. The historical examples are endless. La Mirada’s ascent in recent years was fueled by a combination of strong homegrown talent rounded out with exceptional outsiders. That’s how good programs turn elite. You hate to a condemn a team before a down has even been played, but if you’re connecting the dots, it’s hard to put any heart, pride or trust into La Mirada’s immediate outlook. This isn’t supposed to happen in June, but it did. Ryan Zerbel has resigned as head coach and will be replaced by top assistant Jason Sarceda, who has been in the program for a while.